Terrific to see Bel Esprit sprinter, Canna, back in the winners’ circle yesterday. Steered perfectly by popular hoop, Eddie Cassar (who rode Testa Rossa for his first five wins), Canna flew home over 1200m at Bendigo for a solid victory. 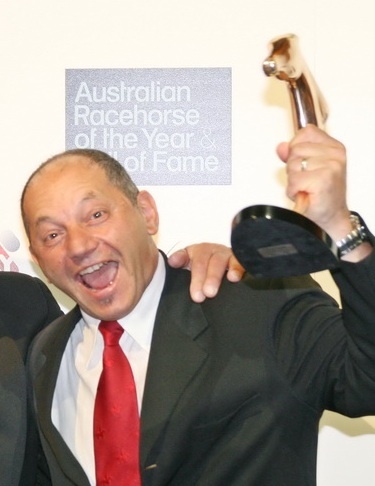 Now trained and owned by Paul McKenna, Canna was originally raced by his breeders – the O’Brien family – and was named after racing paparazzi, Bruno Cannatelli (below). With four wins under his girth strap, the equine Canna is now more used to appearing in front of the camera and he definitely has a longer mane than his namesake!